Stevenage is a town with a population of around 86,000 people lying 28 miles north of London within Hertfordshire. Stevenage was developed as Britain’s First New Town in the 1950s to accommodate a growing population, including post-war migration from the bombed-out East End of London. It was planned with a healthy infrastructure and has a number of green open spaces and large parks, and, uniquely for the UK, 45 kilometres of dedicated cycle ways connecting industrial and residential areas. More recently, Stevenage has experienced higher levels of health inequalities when compared to the rest of Hertfordshire, with smoking, obesity levels and mental health issues above national averages. The council is working hard to transform the prospects for the town and is embarking on a £1 billion regeneration programme that it intends will help facilitate health and wellbeing for future generations. Although it is not mandated with public health responsibilities, Stevenage Borough Council recognised that it has a crucial role to play in improving residents’ health through its services, functions and partnerships. As part of its Future Town Future Council programme, it reorganised its structure to provide a greater focus on health by setting up a Business Unit for Communities and Neighbourhoods. The functions within the unit – wellbeing, leisure and culture; community development; and community safety – work closely with Hertfordshire Public Health. Beyond this, the council considers health and wellbeing a key priority for all its functions. Stevenage has a local health and wellbeing partnership as a thematic group of the local strategic partnership for several years. The transfer of public health brought opportunities to re-energise this, and the Healthy Stevenage Partnership has become a well-attended forum involving the Council, the CCG, local GPs, local NHS providers, the VCSE sector and many other stakeholders. With support from Hertfordshire Public Health, including devolved public health Partnership Funds initially equivalent to £100,000 per year, Stevenage has made good progress on partnership initiatives which have delivered significant local impact. Although the level of devolved funding has reduced because of cuts to the public health grant, the partners remain committed to working together to make best use of resources. The Healthy Stevenage Partnership has developed a Healthy Stevenage Strategy which sets out a vision and priorities for how the Borough Council and its partners will tackle health inequalities up to 2022. Stevenage ‘punches above its weight’ in terms of health because it is willing to invest in activities that are beyond its core functions. The council recognises that investment in health and wellbeing now, will reduce the demands on the public sector as a whole in the longer-term. Much has been done already with limited resources, through developing good partnerships and applying for funding from external sources. More investment would enable the council to do more work with communities in an asset-based approach, moving from providing to engaging and co-producing with communities. Other areas in which the council would like to do more include childhood obesity, healthy eating, and mental health and wellbeing. The strategy was informed by the PHE health profile for Stevenage, supported by Hertfordshire Public Health, and takes account of information from the JSNA, the public health outcomes framework and other sources. The priorities in the strategy are generally areas in which Stevenage ranks significantly worse than the England average on health and socioeconomic factors, and where partners believe they can make the biggest impact by working together. Priorities include physical activity and tackling obesity in children and adults; mental health and wellbeing; older people’s independence; smoking; and health promotion. There is also a focus on health and wellbeing in corporate policies and programmes, such as employment, regeneration and culture. For example, in the cultural strategy, Stevenage Re-Imagined, one of the major aims is to support the development of new arts and health initiatives and programmes, which will include an arts on prescription scheme. The Healthy Stevenage Strategy provides a comprehensive and ambitious approach to improving health and wellbeing in the town. It has been endorsed by the county council, the local NHS and Hertfordshire and West Essex STP. This is important for the council and its partners who wanted recognition that a plan for Stevenage is needed and that there are opportunities to synergise local level preventative health programmes with the STP’s prevention workstream. A locality board has been established which meets monthly to drive implementation of the strategic vision and priorities and to ensure the alignment of CCG, NHS and borough council priorities wherever possible. The Healthy Hub provides a one-stop-shop for health and wellbeing information and support located near Stevenage town centre in a previously unused space within Stevenage Arts and Leisure Centre. The Hub was established and is operated by Stevenage Leisure Limited (SLL) working in partnership with the council and a range of local partners including the NHS, Public Health, and a range of VCSE organisations, some of which provide services in the Hub. Health professionals can refer patients through an exercise referral scheme which includes rehabilitation and management of chronic medical conditions. The Hub provides access to specialist equipment such as an anti-gravity treadmill and a functional electrical stimulation bike which have allowed hundreds of people who could not use standard equipment to become active. Since opening in January 2016 there have been 528 walk-ins, 820 referrals from health professionals, and 12,307 visitors to organisations based in the Hub. 241 people have been referred to other partners and 287 were signposted to community services. The Healthy Hub has achieved financial stability through increasing the take-up of exercise referral memberships and hiring rooms to partners. This means it can function independent of any future subsidy. A key aim of this strategy, which is currently out for consultation, is to increase opportunities for walking and cycling, such as making better use of the borough’s cycle network, promoting liveable streets and encouraging more short journeys on foot. An example of a healthy transport initiative already underway is Stevenage Cycle Hub which provides led-rides, cycle maintenance, reconditioned bikes and cycle training for children and adults. Future developments will see the provision of improvements to the cycleway infrastructure, including resurfacing, lighting and wayfinding, as well as enhanced cycle parking standards. A major part of the first phase of the Stevenage regeneration programme involves a £350 million development in the town centre. One of the schemes that will flow from this programme is the Public Sector Hub (PSH). The PSH will create one central location for council, health and community facilities, replacing outdated and isolated services with modern facilities that encourage service integration and provide a one stop shop for the public. Work is also underway to develop a business case for a new build wet and dry leisure facility that will increase the public offer for future generations. The council has worked across multiple service areas to ensure that encouraging healthy communities is embedded at a strategic level and then becomes a key part of projects as they move towards delivery. Examples include ensuring the protection and enhancement of health, education and leisure/culture facilities in the emerging Local Plan policies and the promoting Hertfordshire’s Health and Wellbeing Planning Guidance in discussion with developers. Stevenage has also worked with Hertfordshire Public Health on healthy places principles and is one of the boroughs that submit major developments for a health impact assessment. A number of interventions have been delivered to address strategic priorities, mostly using devolved funds from Hertfordshire Public Health. Active Herts provides a one-to-one service to increase physical activity among adults by using behavioural change and motivational interviewing. The service is delivered in partnership with GP surgeries and the local hospital and aims to reach people at risk of developing conditions associated with physical inactivity, including obesity, high blood pressure and diabetes. To date, 590 people have been supported to develop a healthier lifestyle. On average, people participating in Active Herts go on to increase their activity levels to at least 60 minutes a week from a baseline of 0 to 30 minutes. Self-reported health, wellbeing and quality of life outcomes have all increased as a result of increasing physical activity. In partnership with Stevenage Sporting Futures, the Council delivered the Go 5 project which educates primary school pupils in Year 5 on diet and exercise. Go 5 has reached 922 pupils and 179 parents across 16 settings. Outcomes show that children taking part go on to have a healthier balanced diet, consume less sugary drinks and snacks and choose healthy swaps such as fruit and water. Time spent being physically active has increased and children reported more self-awareness about their health and a greater understanding of food choices. Mind in Mid Herts has partnered with the Healthy Hub to provide short-term therapeutic interventions to people facing a mental health crisis. The service provides a rapid response to help prevent prolonged or deepening crisis while people wait for further services. Drop-in clinics were set up at the Healthy Hub to allow vulnerable people who may not be accessing services from the Mind Wellbeing Centre due to a lack of knowledge and/or stigma or who may find it difficult to access NHS mental health services in a timely manner via the NHS. Around 265 people have been supported with rapid response and referred or signposted to appropriate services where needed. Self-reported scores of mental wellbeing improved post-intervention. One hundred professionals from the VCSE sector have had mental health awareness training to help promote the service across the town. Since January 2018, Stevenage Independent Living Team has provided falls prevention exercise programmes in four housing schemes for older people. Residents have seen significant benefits since taking part, including improved mobility, flexibility and social inclusion. The team has been successful in obtaining further funding to extend the programme to two more schemes. This has helped residents to improve their functional mobility and activities of daily living. When public health joined local government, it generated interest in Stevenage Borough Council about how we could do more to tackle levels of deprivation and health inequalities in the Borough. We worked with the county council on many initiatives such as tackling obesity and mental health and developing the Healthy Hub. When we started the Hub, we weren’t sure how it would work out, but it has turned out to be extremely successful with many groups, including GPs and the third sector, wanting space there. Stevenage has a strong sense of community and place. 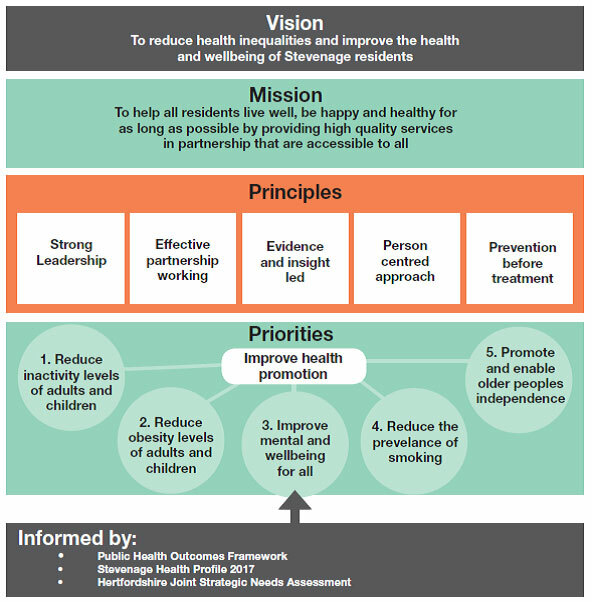 With the development of STPs we realised we needed to raise the profile of the borough so that its health and wellbeing role is taken into account in county council and STP discussions about prevention, so we developed our Healthy Stevenage Strategy. We talk regularly with our colleagues in the local NHS and, over time, have developed good relationships, as can be seen in our Healthy Stevenage Partnership. Stevenage has a varied and active third sector whose activities, such as exercise for older people, make a big contribution to health, and who are an important part of our partnership. Because we feel strongly about the importance of health and wellbeing for our residents we are willing to put in the hard work needed to provide non-statutory services. Some of these can be arranged at very low cost, but to make a comprehensive difference, public health would need to be properly funded so that funding could continue to be used in boroughs and districts. The contribution of Stevenage and the other boroughs and districts in Hertfordshire to health and wellbeing is invaluable. I view myself as Director of Public Health not just for the county council but for every borough and district, each of which has different needs, priorities and aspirations. Public health in Hertfordshire works hard to foster good relationships with second-tier councils because they present essential opportunities to join up services and shape places. As well as devolved funding, we provide support in a range of ways, including linked public health staff, and information/advice such as our guidance on public health and the planning process. Stevenage has a strong commitment to improving health and wellbeing and building this into its infrastructure. The Healthy Hub is an excellent example of a communitybased service and I would like to see this sort of model rolled out in the county. There are also plans to build a sexual health clinic in the town centre as part of regeneration plans, bringing this service to an accessible, community setting. There is a national expectation that local government, including boroughs and districts, will deliver on prevention but little acknowledgement that this requires proper funding. If public health was effectively resourced we would be able to move further and faster with our colleagues and partners to roll out initiatives such as social prescribing, community-based lifestyle services linked with support for wider determinants, healthy streets initiatives, resilience and socialisation in young people and decent housing standards enforced in the private sector. For a borough council to have a voice in major health and care developments such as the STP, it is helpful to have a clear vision, priorities and plans which demonstrate the borough’s contribution to health and wellbeing and how it will work in partnership. Relentless pursuit of partnerships and using influence and leadership to demonstrate to others what they can gain by working together, are fundamental to taking a place-based approach to improving health.